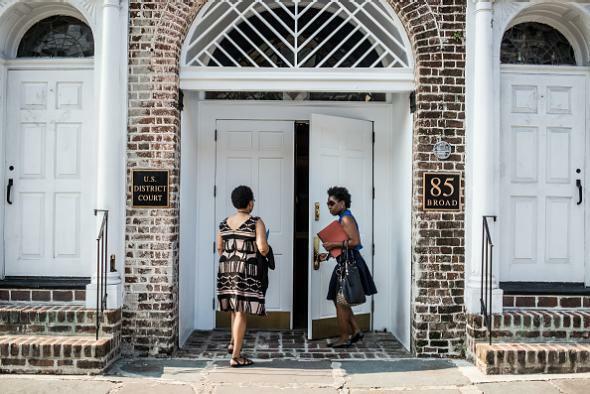 Charleston church shooter Dylann Roof found guilty. The federal courthouse in Charleston, South Carolina, in a photo taken July 31, 2015, before Roof appeared for an arraignment hearing. A jury has found 22-year-old white supremacist Dylann Roof guilty on all 33 federal hate-crime, obstruction of religion, and firearms charges that he faced after killing nine people at the Emanuel AME Church in Charleston, South Carolina, on June 17, 2015. The jurors needed only two hours to reach their decisions; Roof’s defense attorney conceded that Roof killed the victims, who were gathered at the church for a Bible study session, arguing only that he was “confused or delusional rather than rational” when he did so. The defense did not call any witnesses. The jury will reconvene in January to determine whether Roof will be sentenced to death or to life in prison. He will be representing himself during that phase of the trial. Roof also faces a state-level murder trial that could end in a sentence of death.